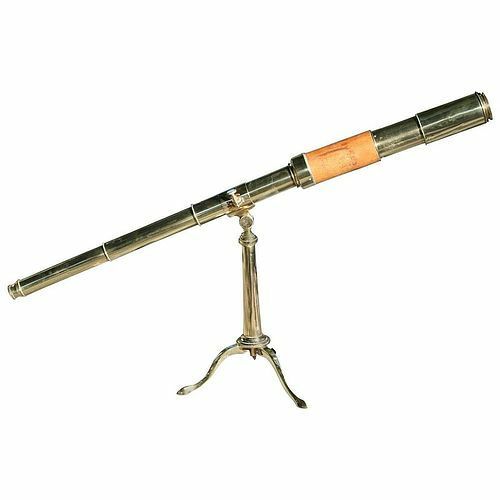 Antique Refracting Brass and Mahogany 4-draw Telescope with a Brass Tripod Tablestand, and having slides to cover both lens and eyepiece. English, late 19th C.
Provenance: The Harry Z. Isaacs Collection from Historic Long Branch Estate, Virginia and James Kennedy Antiques., Ltd., Durham NC. 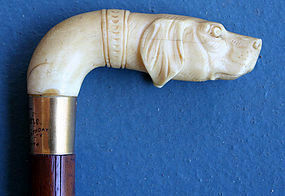 Antique Cane with dog-form carved ivory handle and a gold collar inscribed: "From Wm. 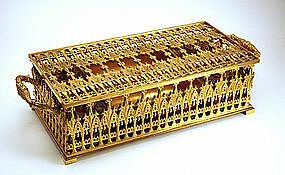 Henrie on his 75th birthday, November 6th 1874"
Antique English Sheffield plate cake basket of rectangular form with shaped rim with applied gadrooned edge and floral decorated handle. Mid 19th century. This item has been stolen. Please contact us or the Alexandria Police Department if you see it. 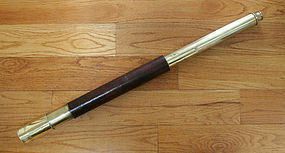 Antique Brass 6-draw Spyglass, with ring turned body and sunshade and eyepiece slide. Provenance: The Harry Z. Isaacs Collection from Historic Long Branch Estate, Virginia. 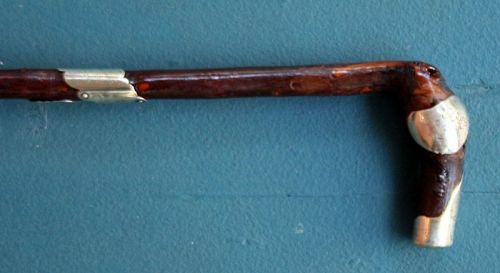 Probably English, circa 1870. Patent Model for an Improvement Air Engines by Dana Bickford retaining the original Patent Tag dated June 6th, 1865 and with a Certificate of Authenticity and copies of the Patent Application. Unusual Antique English Silverplate Wine-bottle Server with hinged body to accomodate bottle and applied handle. Impressed makers mark and registration number date this to 1897.
n.b. This fits many, but not all shaped bottles.